It’s like a terrorist scenario from a TV crime show, and it can be terrifying. But it’s becoming more prevalent every day! It’s called ransomware. 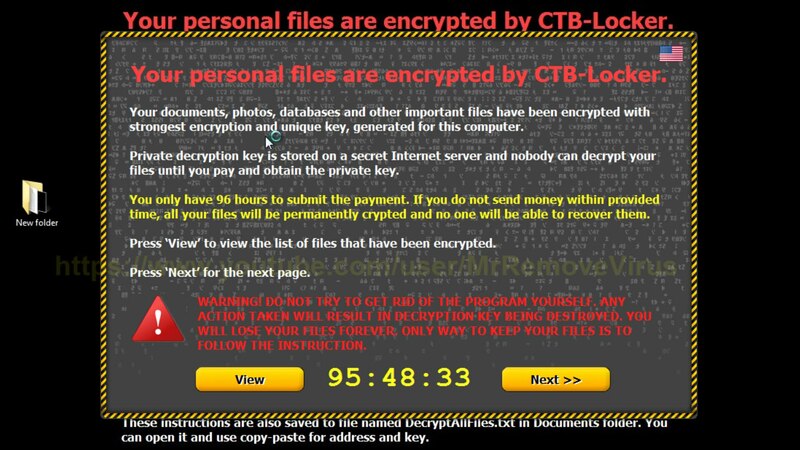 Ransomware is a type of malware that gets installed on your computer through any of a number of channels. It encrypts some or all of your files, and then, through a pop-up notice, tells you that your computer has been rendered unusable, and that the only way to get your data back is to pay a ransom. Once the ransom is paid, the perpetrators email you a code to unlock the encryption. Some of the notices are crafted to make you think the FBI is shutting your computer down. But, always, it is simply a type of extortion. Once you have received the notice, you have a limited time to pay the ransom, usually through bitcoins or some relatively untraceable online method. The perpetrators are in countries all over the world, from Europe and Russia to the Middle East. Reformat the hard drive of your computer, reload Windows and all your programs, and restore your data from backups (if you HAVE backups). That’s it. How prevalent is this type of infection? The antivirus companies have identified hundreds of thousands of different varieties from all over the globe. Back up your documents, pictures, data files (like QuickBooks, tax, and business files), music files, videos – anything that’s important to you. And do it often. Backing up is not nearly such a big deal these days with the ubiquity of cloud storage and backup services. Make sure you have a good backup off-site (what if your house burns down?). Be sure you have good, up-to-date antivirus and antimalware protection that updates itself daily, monitors system activity, and performs full system scans on a regular basis. Make sure your home wireless network is protected with a pass-phrase that is not easy to guess. Apply Windows Updates and program updates when instructed to do so. Vaccinate your computer against the malware which carries ransomware. Bitdefender Antivirus (my personal favorite – both the “pay for” and free editions) has released a “vaccination” program for free, which protects your computer against a large percentage of known ransomware. You can download and install the vaccine here. The Bitdefender products have been at the top of the list for both detection and removal for the last three years running. So far, antivirus companies and law enforcement agencies don’t have a way to stop this, so the best you can do is be vigilant, be smart about using your computer, and be sure your data is backed up. Let’s just go ahead and move that one right on up to the top of the list.